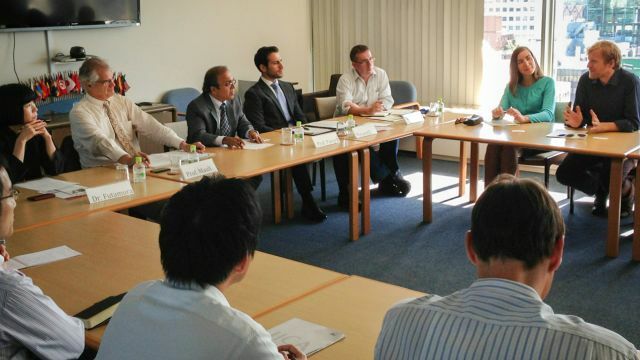 On 18 September 2013, the United Nations University (UNU) welcomed participants of the 8th German-Japanese Young Leaders Forum to UNU Headquarters in Tokyo, Japan. Professor Hanns W. Maull, Senior Distinguished Fellow at the German Institute for International and Security Affairs, led the group of aspiring global development leaders in an exchange of ideas with a panel of UNU academic faculty on the theme of United Nations Security Council reform. The Young Leaders presented two scenarios to the UNU panel for world politics in 2030, developed on the basis of their deliberations, which envisioned a world with challenges that permeate state borders. The first scenario was very positive, suggesting that we can attain a better world in 2030. However, this was only after we had been through turbulent times. The scenario projected that the current situation in Syria would explode into a regional conflict, and that there would be a major terrorist attack in 2014 followed by a global pandemic. These shocks would push the world towards a new cooperative approach and the situation would gradually begin to improve around 2020 with new technologies and better access to resources. The second scenario was darker and envisaged the collapse of several states, problems with energy availability and resource scrambles. Growing global debt and the aforementioned problems meant that economic growth was much lower and the gold standard needed to be reintroduced. The scenario called for countries to find new ways to work together and suggested the need to view resources and energy as a common heritage for humankind, coupled with a responsibility to share. The central question for the subsequent discussion was the implications of these scenarios, if they were to become a reality, for the relevance of the United Nations Security Council as an important international body dealing with world peace and international security. The goal of the exercise was to develop policy recommendations that would ensure continued relevance of the Security Council in 2030 given changing power relations, emerging state and non-state actors, and other critical security and development issues. The two scenarios were addressed by the UNU panel, chaired by UNU Vice-Rector Govindan Parayil and including Madoka Futamura (UNU-ISP), Brendan Barrett (Office of Communications) and David Passarelli (Office of the Rector). The discussions covered the United Nations’ credibility as a global actor, paying particular attention to its ability to create global norms and values in a divided world. The UNU panelists provided comments on both future scenarios and on the feasibility of the proposed solutions. The German-Japanese Young Leaders Forum is organized by the Japanese-German Center Berlin and funded by the Robert Bosch Stiftung (the Robert Bosch Foundation).